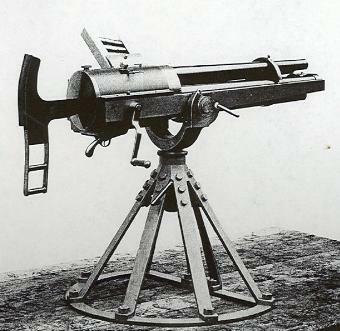 The French Navy required a much more powerful pattern gun for service afloat; this gun had a calibre of 47 mm (1.85 inches), and fired a shell and a hardened steel shot of 1.1 Kg. (2 lbs. 6 ounces) in weight, with an initial velocity of 455 m/s (1,490 feet/s). 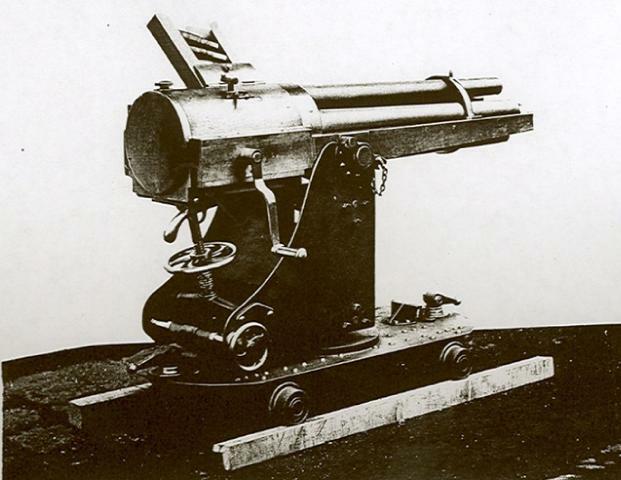 The gun weighed 575 Kg (11 cwt.) and was the largest model of Revolving Cannon that could be carried on a ship's boat. The animation shows the gun on a boat carriage. 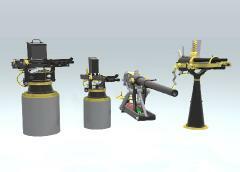 The 47 mm Revolving Cannon can be aimed by the gunner using a more substantial shoulder stock. Due to the weight of the gun, it was necessary to add a third man to the gun crew, and to provide a trigger for the gunner so that aimed shots could be fired. While the gunner aims the piece, the second man turns the hand-crank, which is now placed on the side like a "Gatling". The gun is worked in the following way – one man turns the crank, and makes one turn for each shot; there is a simple arrangement which stops the crank automatically at the proper point so that no thought or training is required for this work. The captain of the gun points it and fires by pulling the trigger very much as in a small-arm (of course there is no recoil). A third man then feeds it with cartridges. This arrangement at once brought the rapidity of fire and the ease of working about equal to the light 37 mm gun, and as with this one the maximum rapidity of fire is now about 60 per minute. At point-blank range the steel shot passes completely through 1.75-inch steel plates, the shell perforates 1-inch steel plates and bursts after having passed through them. At present I do not know of any existing 47mm Revolving Cannon. If you know of one, please let me know its location, and if possible send me photos that I can include in the Gallery. See my contact details.